The IWC has a staged level of experienced judges. The majority of these judges have been with us for many years and have moved up the scale. We not only judge wines but we judge judges too! We expect our Panel Chairman to report on each judge on their panels and also the judges to report on how the panel chairman leads the panel. We take action based on these recommendations, either promoting, demoting or de-listing judges based on their performance at the IWC. We do not confine our judges to one area, region or style. 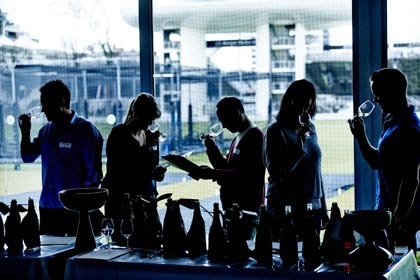 We expect our judges to have a global knowledge of wines and styles, and to judge them accordingly. If they are not certain on a style, they have their panels and co-chairmen to back them up. At the IWC we believe in keeping your palate fresh and the day interesting. A typical day will start off with a flight of Sparkling wines, then a flight of reds, then whites, back to reds and so on. Then the day will finish with Sweets, stickies and ports. Then you can have a beer! Tasting panels are usually made up of a Panel Chairman, Senior Judge, 2 Judges and an Associate judge. 5 people is the optimum number of judges to make the process quick and the discussions diverse. All communication is in English and we separate judges from the same countries (apart from UK based judges) so there is no country specific bias. 6 Co-chairs are responsible for all wine related matters. The Co-chairs are there as a safety net so that not one wine gets missed. In round one they taste all wines that have been given out or commended to check the decision is correct, and if required, give them another chance in round 2. In round 2 they re-taste everything for consistency. A Panel chair may see 2 flights of Chenin Blanc. The Co-chairs will see 20! The Co-chairs mostly agree with the Panel Chairs but if they think a decision by the panels is 'harsh' or 'over awarded' they can adjust the score up or down. But importantly they need to get another Co-chairman to agree and sign to say they agree before any change is made. Arguments are not uncommon. But this means the IWC's judging is fair and consistent and every wine has a chance. Our Panel Chairs are our most experienced judges. They lead their panels based on our judging process. They need to have excellent tasting ability across all varietals and styles. They must be great communicators, diplomats and guides. They must have the ability to lead their panels without telling them what to do, and help less experienced judges through some unusual wines! They will judge for us for a minimum of a week to ensure consistency in the judging process. We have about 30 Panel Chairmen on our list, usually we run 25 tables depending on the volume of wines. They are expected to taste 100 wines per day in week 1 tasting. In Week 2 about 60 wines per day. PC's must give their scores last in the wine tasting so not to influence the scoring of other panellists! A Judge generally has less experience than the Senior Judges, but is getting there on their experience. They know global wine styles and can comment in discussion. The vast majority of people are judges. All potential judges start off as an Associate Judge, with the exception of MW's who can go straight in as Senior Judges. Associate judges very in abilities, but all will be new to the IWC so will either need to get to know our system and judging process. Remember panels will be tasting approximately 100 wines a day and sometimes if it’s your first time, it can be tough. So if it's your first time judging at the IWC, don't be disappointed if you are asked to be an Associate. As soon as we know your abilities you can move up the scale pretty quickly. We expect our Associate judges to be promoted within 3 years. If you done we may ask you to leave and gain more experience before judging at the IWC again. Associates can only taste on two days. The IWC does not take into consideration reputations of judges either given by themselves or others. We mark them on their performance as judged by their peers. As an Associate, if two panel chairman report a good performance and high scores based on their assessment, they will be promoted to Judge. As a Judge this will also be the same process to be promoted to Senior Judges. Senior Judges could be asked to be Panel Chairs based on their abilities and their availability to taste for a full week. Panel Chairs can be promoted to Co-chair. Peter McCombie MW was promoted to a Co-Chair in 2010 after many years as a Panel chair. These promotions don't happen very often! The IWC collates all of this information and the Co-Chairs go through every report and verify all promotions and demotions! The Panel Chairs also get judged based on their performance based on the Co-chair changes as well as reports from their panels. Over critical or over generous Panel Chairs can be spotted and reported back. If their panels feel that their Panel Chair is too overbearing or dominant that information also feeds back to us.